The Droll Yankees New Generation Peanut Feeder has a durable, lasting design that will surely make a wonderful addition to any backyard sanctuary. Birds may easily cling on the wire mesh tube to dine. This durable, 0.25" stainless steel wire mesh perfectly holds 1 quart of seed. The internal seed baffle design ensures that the feeder empties completely, and the open mesh keeps the seed level visible at all times while ensuring feed remains fresh and dry. Simply slide the heavy metal cap up the included hanger to clean and fill the unit. 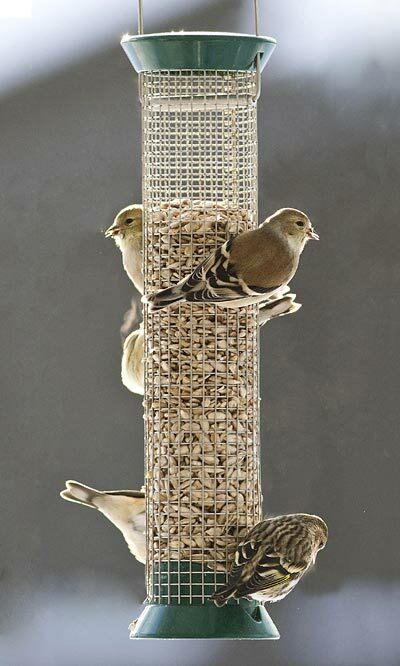 This classic, durable item is built to survive the elements of nature while serving your backyard birds their choice of peanuts or sunflower seed, and is a favorite feeder of many avid birders. This piece may be hung with the included 5" wire loop hanger or pole mounted using any pole with a standard 3/4" threaded adapter. Lifetime guarantee.